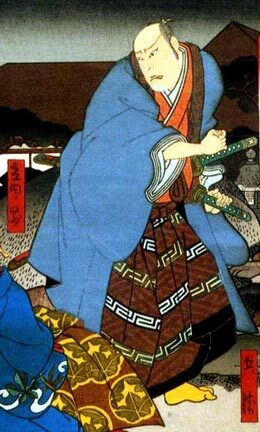 Arashi Izaburô II held the name of Arashi Kanjûrô I from the 11th lunar month of 1800 to the 10th lunar month of 1841. Born in 1805. 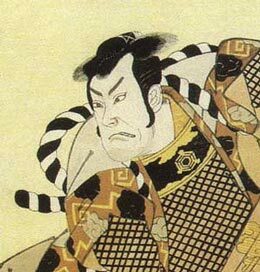 He started his career as a disciple of Arashi Rikan II, who gave him the names of Arashi Torazô, Arashi Tokumatsu and Arashi Kitsugorô at unknown times. He took the name of Arashi Kanjûrô II in 1838. This name was still used by Arashi Kanjûrô I in Edo (up to 1841). The second Kanjûrô performed in Kamigata, Ise or Nagoya but never in Edo. He died in 1862. This tachiyaku and oyajigata actor was said to be better in jidaimono than in sewamono. There will be in the future to come a full page dedicated to Arashi Kanjûrô II in kabuki21.com. Born in Kanazawa in 1819. Disciple of Arashi Kanjûrô II, his first stage name was Arashi Kichizô. He took the name of Arashi Kanjûrô III in 1851, when he went back to his native city. This name was still used by his master up to his death in 1862. The third Kanjûrô died only two years after the second, in 1864. Born in Kanazawa in 1851. 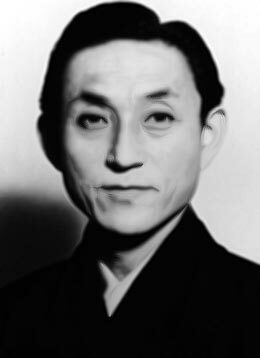 Son of Arashi Kanjûrô III, his first stage names were Arashi Kofuku and Arashi Rinosuke. He took the name of Arashi Kanjûrô IV in 1870, to commemorate the 6th anniversary (7th memorial service) of his late father. He also made a formal shûmei in Tôkyô at the Okudaza in 1887. He was an extremely popular tachiyaku actor in Kanazawa, where he was nicknamed Kaga no Danjûrô (the Danjûrô from the Kaga Province). He died the 27th of November 1925. Born in Korea the 25th of August 1926. He started his career as a disciple of Nakamura Kichiemon I, making his debut in April 1939 at the Minamiza, where he received the name of Nakamura Kichitarô and played a little role in the drama "Nijô-jô no Kiyomasa". He joined the travelling troupe of Ichikawa Monzaburô III in Summer 1947 and took the name of Ichikawa Yasujûrô. After his success at the nadai exam, he was allowed to take the name of Arashi Kanjûrô VI in February 1951, at the Minamiza, where he played in "Soga no Taimen", "Oboro Kago" and "Benten Kozô". He became the attendant of Nakamura Ganjirô II in 1953 and joined the Takarazuka Shingeiza troupe and the Daihô Geinô in 1955 and in 1959. He went back the Shôchiku Company in 1978 and was often seen in Ichikawa Ennosuke's productions. One of the best roles of this supporting tachiyaku actor was Kawatsura Hôgen in the opening scene of "Shi-no-Kiri". He died the 22nd of December 2008.